W L Wyllie (1851-1931). Watercolour signed (LL) and annotated "Laertes firing a torpedo" (feint) and other ships names (very feint)..
Standard size: 17.7 x 10.8 inches (45 x 27.5 cms) approx. Provenance: with the Rembrandt Gallery. This watercolour features as colour plate no. 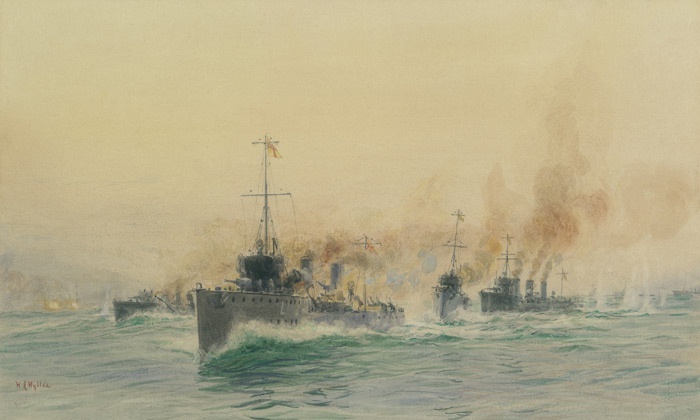 3 in “Sea Fights of the Great War” (Destroyers engaging the German cruiser MAINZ) by W L Wyllie RA and M F Wren (published by Cassell and Company Ltd, 1918). Wyllie’s book describes how the Royal Navy had safely overseen the transportation of the British Expeditionary Force to France in early August 1914 (without, it should be said, the loss of a single life to enemy action). Commodore Roger Keyes (Commodore 8th Submarine Flotilla) had worked ceaselessly to contribute to this, his submarines keeping watch by day and night, without relief, on the entrances to the German rivers should the High Seas Fleet decide to venture out to interfere with the troop transports. This plan was then developed further and became an attempt to actually draw the German fleet out and into the waiting arms of Admiral Beatty’s battle cruisers who were at very short notice to sail and give battle. The ships painted here (L to R) are SMS MAINZ, HMS LIBERTY (Lt Cdr N K W Barttelot RN), HMS LAUREL (Cdr F F Rose RN) and HMS LYSANDER (Lt Cdr G W Taylor RN) hauling out to port ahead of HMS LAERTES (Lt Cdr M L Goldsmith RN). The watercolour carries Wyllie’s pencil notes identifying each ship along the bottom but they are very feint: more visible is his pencil writing “Laertes firing a torpedo” which he has overpainted in red (as with his signature).